Dr Awais Yaqub is a Pakistani doctor and an MSF deputy medical coordinator in Pakistan. He is currently working in Charsadda, one of the districts hardest hit by the floods. 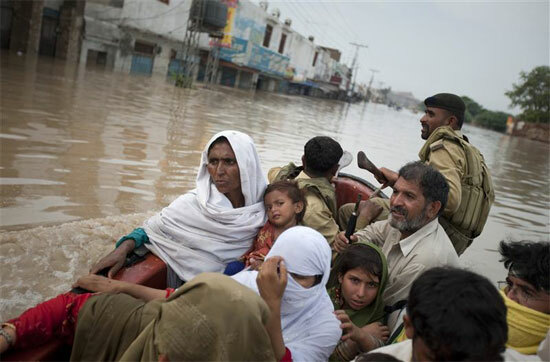 Army soldiers use a boat to evacuate a family through a main road in Nowshera, located in Pakistan's northwest Khyber-Pakhtunkhwa Province. 31st July 2010. REUTERS/Adrees Latif, courtesy of www.alertnet.org. What is the situation like today in Charsadda district? Many houses in the district were flooded by water and half of the town of Charsadda itself was flooded. Many people sought refuge on rooftops of buildings surrounded with water. Those strong enough swam to dry land, where they could do nothing but wait for the rest of their families, women and children and old people, to be rescued. Fortunately, over the last two days rains have stopped in this district and in several places, the water has receded significantly. Does this make things better in terms of access? Definitely, it has allowed us to reach more people in remote locations. But the flood-affected area is so vast… The population of the district is estimated at approximately one million. We are very far from having a complete picture of the needs people have. According to our assessments in the district, what people need most is drinking water, food, and medical care. Thousands are homeless or have sought refuge in empty buildings or schools. They don’t have clean water. They don’t have anything to drink, and there is little to eat. It’s muddy everywhere, so unhygienic conditions are also a major issue. What work are your teams doing? Water is the first thing we’re working on. We are improving water quality. Where it is possible, we are bringing safe water to people by truck. Water and sanitation teams are working hard to chlorinate contaminated water points. In Charsadda district, we are also using 21 smaller vehicles, loaded with water, to get to harder to reach places, where often no one has been yet. Yesterday we distributed 30,000 litres in the district. We are also preparing a distribution of hygiene kits (buckets, soaps, towels, toothbrushes, etc.) and other basic items such as blankets, mattresses, jerrycans, plastic sheets, bed-nets and kitchen utensils. Our third priority is medical care. So we have organised two medical teams. Twice a week they are visiting six locations where medical needs are high. What kind of medical problems are they seeing? There are a lot of skin infections and respiratory infections. Diarrhoea is also increasing. They are also caring for patients suffering from chronic diseases, such as diabetics, who may have lost vital drugs during the flooding. In medical centres, we have seen a lot of physical trauma. For instance people who were swept away during the floods or wounded when their house was damaged. I came across a woman with lacerated wounds on her arm. She had a dressing but said it was so painful she wanted us to look at it. We examined the wound during the consultation and changed the dressing. Is there a risk of cholera outbreak? We are in an area endemic for cholera. Now is the peak season, between July and November, so the risk of disease is very high. Most of the city water supplies have been damaged or mixed with floodwater and sewage. People who are on the ground don’t have access to safe water because wells have been contaminated and hygiene conditions are very bad. It may soon lead to be a big health problem. Are people desperate or panicking? You can really see the frustration. Aid is coming, but the scale of the disaster is such that it is clearly not enough, especially in terms of drinking water. We are working hard to provide as much as we can but we are the only organisation doing this in Charsadda and the scale of the problem is so big... We have decided to assess the mental health situation here, as many people are still in a state of shock. They are still scared of water coming back, of new floods taking them by surprise. They still fear for their lives.